Since I only review quality games that aren’t pure clones (meaning that, if clearly inspired by another game, they at least demonstrably add to the formula), I wasn’t sure this game was going to make the cut for review. I decided to try today’s game anyway, as it came from Social Loner Studios who made “What The? !” which I played and enjoyed waaaaaaaay back on Day 011. Today’s game ended up not being what I expected, though, and that’s a good thing. 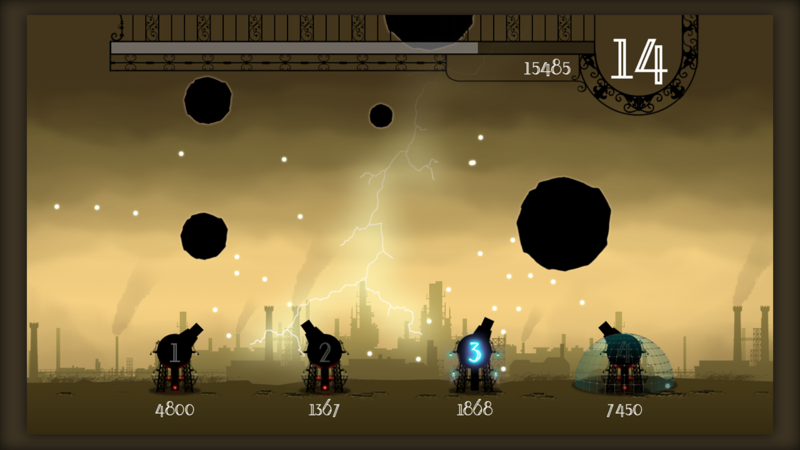 “Storm” takes the survive-’em-up gameplay of Missile Command, and turns it on its head. You don’t destroy the incoming meteors, you merely attempt to redirect them (I’m not sure which is closer to the reality of the physics behind intervening during a massive meteor storm). Why’s that an important difference, you ask? Well, the game feels a bit more like pool because you have to consider the angles you’re going to get things flying around on. But there’s one more important difference, and that’s in multiplayer. Suddenly you have the ability to simultaneously save yourself while sending death towards another human player; you’re also watching for opponents to do the same to you, which amps things up a notch. “Storm” succeeds by reinventing something familiar, and I like that. The presentation is a cross between Penny Arcade’s Twisp & Catsby, and XBLA hit Limbo; 80 Microsoft Points is the cost of entry. “A storm is brewing… Defend yourself!